The habitats in Cordell Bank National Marine Sanctuary support an abundance of fishes. The area around Cordell Bank supports more than 180 species. The most abundant are the rockfishes, ranging in size from the 8-inch pygmy rockfish to the 3-foot yellow-eye rockfish. Fish distribution and abundance on the bank are related to habitat type, depth and location. The shallow, rocky pinnacle regions of the central bank are dominated by schooling species such as first year rockfishes and pygmy, widow and yellowtail rockfishes as well as more solitary species, such as rosy rockfish. Boulder-rock habitats are home to pygmy, squarespot, yellowtail, rosy and greenspotted rockfishes, lingcod, painted greenling and the blackeyed goby. Boulder habitats at the edge of the bank host large communities of commercially important species, such as bocaccio, yelloweye and canary rockfishes as well as lingcod. 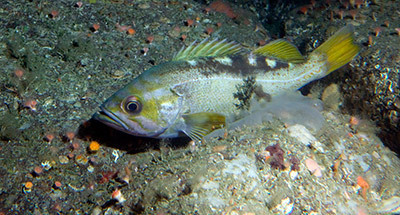 Cordell Bank is an important site for the success of juvenile rockfishes transitioning to their adult life stage. These first-year species are important prey for salmon, seabirds and adult rockfishes as they provide an important energetic link in the food chain of this system. 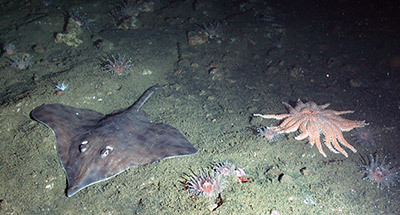 The soft bottom habitat in the sanctuary is an ideal home for flatfishes, skates, and rays. In addition, a number of spindle-shaped fishes such as croakers, rockfishes, sculpins and surfperches also thrive in soft bottom habitats. Fishes most commonly found in the middle shelf (100 to 325 feet) include: big skate, longspine combfish, shortbelly rockfish and pacific sand dab. On the outer shelf (325 to 655 feet), fishes more commonly seen include the stripetail rockfish, greenstriped rockfish and slender sole. In the upper slope region (655 to 1,640 feet), fishes most commonly found include poachers, splitnose rockfish and sablefish. Among the fishes that inhabit all three depth zones are lingcod, spotted cusk eel, plainfin midshipman and Dover sole. Most of the water column habitat within the sanctuary overlies the continental shelf and makes up the coastal pelagic realm. While few directed studies have been performed at this sanctuary, a considerable amount is known about California's coastal pelagic fishes. Fishes that occupy the shallow epipelagic zone (depth to 164 feet) are relatively large, active, fast-growing and long-lived. Fishes commonly placed in this group include sharks (blue, white and thresher), jack mackerel, Pacific mackerel, Pacific hake, and Albacore Tuna. 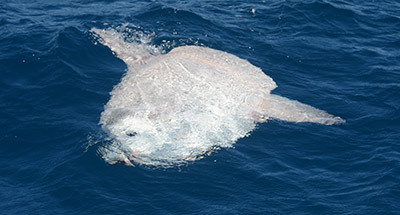 The ocean sunfish is among the most common pelagic fishes in the sanctuary. We also know that the early life-history stages of many fishes - such as lingcod, rockfishes and many flatfish species - occupy the epipelagic zone. Anadramous fishes, including coho and chinook salmon and steelhead, seasonally occur in the sanctuary. Mesopelagic fishes (those found below the epibenthic zone, to depths of 3,280 feet) are relatively small, slow-growing and long-lived. Representatives of this group include the lanternfishes, hatchetfishes and deep-sea smelts. For more information on fishes within Cordell Bank National Marine Sanctuary and the research being conducted on this topic, please visit the Sanctuary Integrated Monitoring Network (SIMoN).